We have all asked for it, a AR15 that shoots 12 Gauge shotgun shells. Seems like a simple request, however if it was so simple someone would have done it sooner. Ucyildiz Arms of Turkey took on the challenge by developing the Akdal 1919 and has come closer than anyone has before with something feels and shoots like a 12 gauge AR15. The Akdal 1919 is produced in Turkey by Ucyildiz Arms and imported into the US by RAAC Firearms the same ones who thankfully import the Saiga shotguns we also love. I decided it was time to give this shotgun a whirl and see whether this was a viable defense and sport shotgun and what I found was a fast shooting AR15 scattergun. The Akdal 1919 is comfortable, shoulders and points extraordinarily well and generally feels and operates just like a light AR15. In the land of 8lb AR15s, this 6.5lb shotgun feels very light considering its overall larger size compared to your standard AR15. 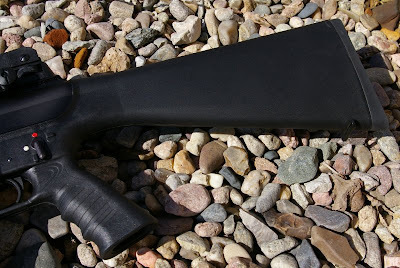 This is a shotgun priced at around a $750+ street price so the polymer castings are a little rough in a few spots but still very well thought out, extraordinarily comfortable, and very ruggedly made polymer. The polymer sight and the polymer detachable A2 style carry handle/sight do feel a bit cheap however it proved durable and works to place shots where they are needed. I understand the copious use of polymer from a cost and weight perspective and judging from the rounds I put through this thing, durability was not an issue. This is a shooters shotgun not a wall hanger and some will note this is not a thing of beauty. On the other hand, I dare you to attempt checking out of a gun shop with this thing without at least half a dozen people wanting to look at it and ask questions. 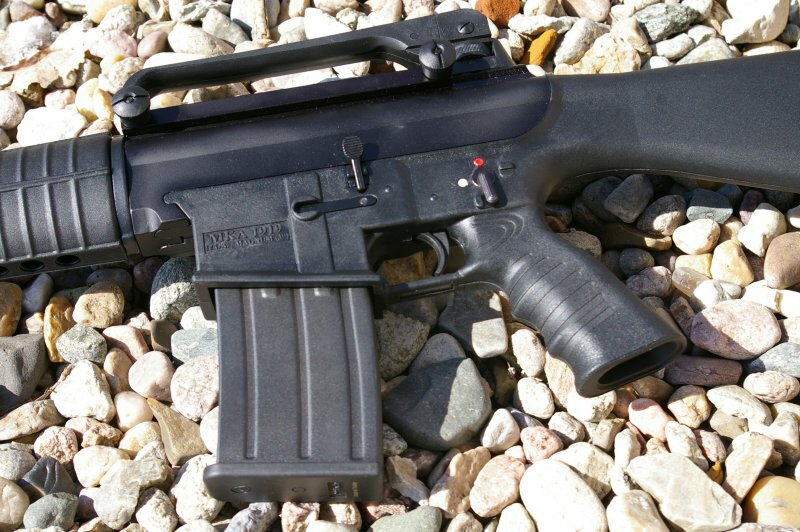 For most of us AR nuts, the Akdal 1919 is an awesome design that shoots as well as it looks. The Akdal 1919 semi-automatic shotgun is a conventional gas-operated action which is located around the support tube that runs below the barrel along with the return spring. That mechanism is concealed by a polymer hand guard held in place with standard shotgun style retaining nut with sling attachment. 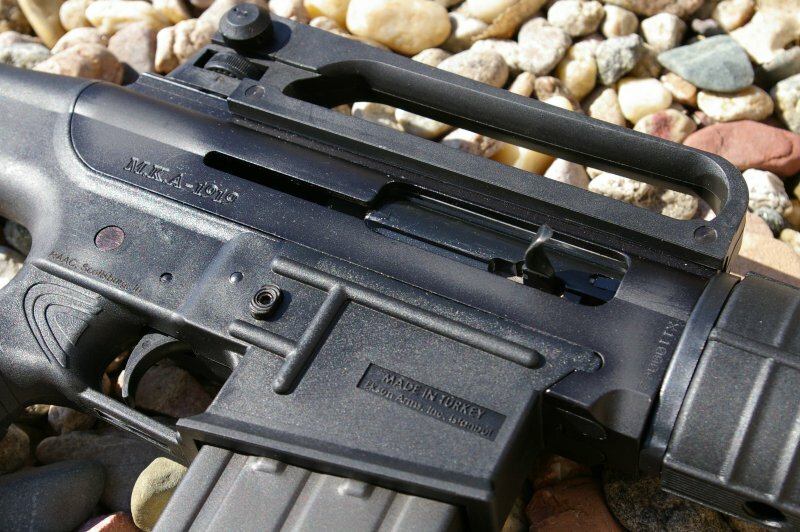 The upper receiver is manufactured from an aluminum alloy while the lower receiver, pistol grip, and stock are manufactured as one piece from impact resistant polymer. The grip and buttstock are very comfortable to shoot with and the buttstock features a sling mount and thick rubber pad. Although the ergonomics are good, I would have liked to see a design option where standard AR15 grip and 6-position stocks could be added, however on this version does not. 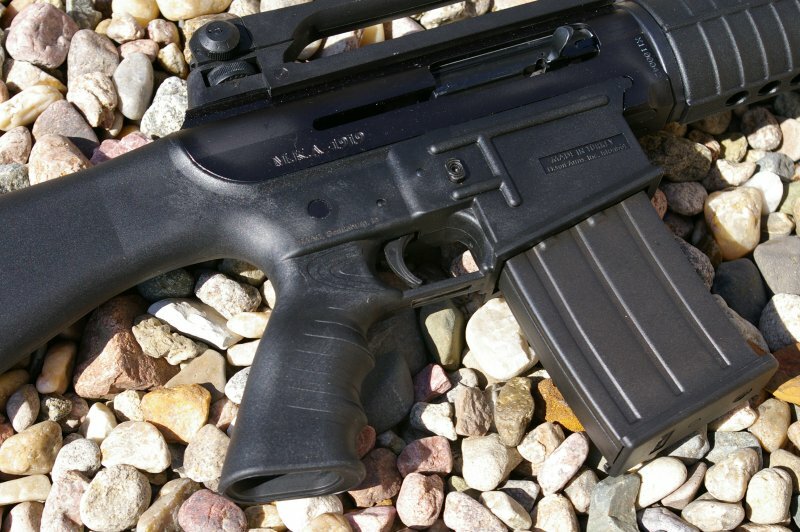 The MKA 1919 requires no gas system adjustment to shoot 2 ¾” or 3” shells and comes with two 5-round metal detachable magazines, one for 3” and the other for 2 ¾”. My advice is to buy a bunch of extra magazines in each size, as they tend to go empty pretty fast. I am told high capacity 3-gun magazines are on the way - joy. Chances are only a few people will use the other chokes, however if you are a hunter or opt for the camo “BONZ” AKdal 1919 version either include three internal screw in chokes for lots of hunting versatility and comes with the Improved Cylinder choke installed. 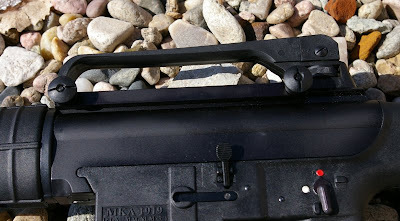 The magazine release button, bolt release and safety lever all mimic the M16 rifle location as does the bolt release. The manual safety also duplicates the M16 style being located on the left side of the receiver above the pistol grip. 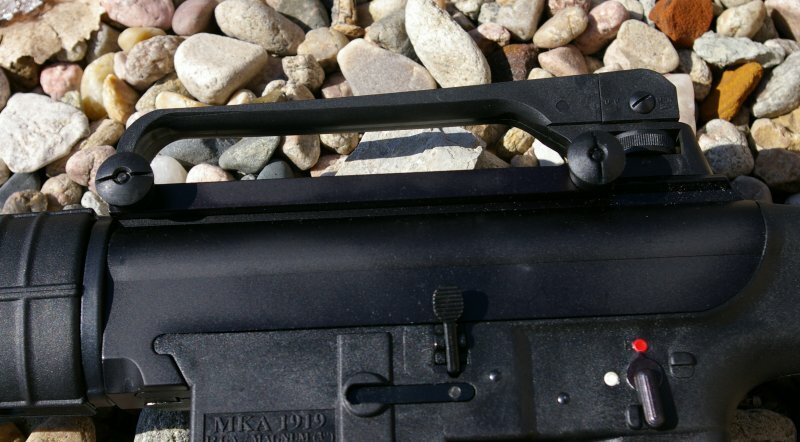 The top of the receiver has a detachable picatinny mounted carrying handle. 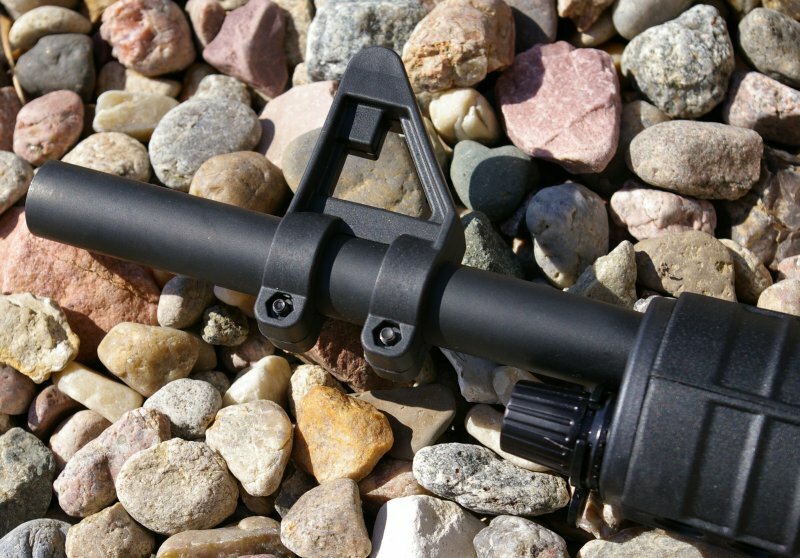 With the carry handle/sight removed any optic or sight can be mounted to the upper receiver as you would any flat top AR. Functionally the Akdal 1919 works like your standard Remington 1100. Fit and action overall was actually a bit tight and the action needed breaking in. After several jams from my first box of shells, I contacted RAAC and asked what I was doing wrong. They suggested I run it hard and charge it like I was mad at it through the first fifty to seventy rounds. The Akdal 1919 does require a break-in period otherwise the fit is a bit too tight initially and you will have a few failure to feed issues here and there until everything is broken-in. Four to five boxes of shells put the beat down on any tight spots and everything will feed and functions just like a Remington 1100 except you can just push in an extra mag to reload. After that break-in the Akdal 1919 has been phenomenally reliable, actually I have not cleaned it in over twenty boxes of ammo and it just keeps running. You quickly forget the initial pains of the first couple boxes of shells once everything smoothes out. The Akdal 1919 shoots so fast, smooth and softly with such little recoil that really fast shooting can take place. 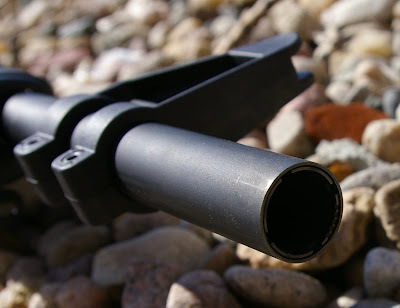 Initially empty magazines did not drop free, however once they saw a little use, mags were dropping free and I was speed-loading another mag followed by another light recoiling 5 round shot string. This is without a doubt the most fun shotgun I have shot in a very long time and one I can and do shoot for an afternoon of drills. The gas operated system manages recoil to a very light feel with 2 ¾” rounds and is still very manageable with the big 3” rounds. Ergonomically, your mind thinks you are shooting an M16 and feels about like an AR10/308 format AR and I can see this would be a huge favorite for 3-Gun competitors once a larger capacity magazine comes out. This is a cool looking shotgun which draws a crowd, and is a freaking blast to shoot fast and hard. Get beyond the first 50-75 shells and problematic failures give way to smooth shooting and total reliability. I can see new three-gun competitors hitting the field with the Akdal 1919 once the high capacity magazines hit the market. I have heard and seen some customized Akdals with muzzle brakes and even six position stock modifications, however I have not tracked down who is doing these modifications, but I will try. Will I take this duck or goose hunting? You betcha and loaded with 00 buckshot it can also handle those intruder level varmints as well. 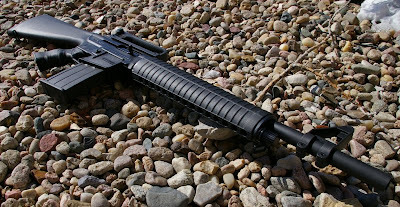 I guess we were all right to expect and ask for a 12 gauge AR15, because this is far too much fun to shoot whether you are a 3-gunner, rabbit hunter or someone looking for a good defense shotgun. Barrel Length - 47 cm. Overall Length - 96,40 cm.